The Hudson Bay Railway line proved no match for the uneven, boggy terrain of the Hudson Bay Lowlands this spring. On June 9, a news release from OmniTrax Inc., its owner, said it had suspended service indefinitely on the railway from Amery, 29 rail miles northeast of Gillam, to Churchill — a section it had been unable to operate since May 23. A preliminary assessment by an independent engineering firm found the flooding had washed the track bed away in 19 locations, the release said. The flood “visibly damaged” five bridges with another 30 bridges and 600 culverts needing further assessment. “The damage is unprecedented and catastrophic,” the release quoted Peter Touesnard, Chief Commercial Officer at OmniTrax. 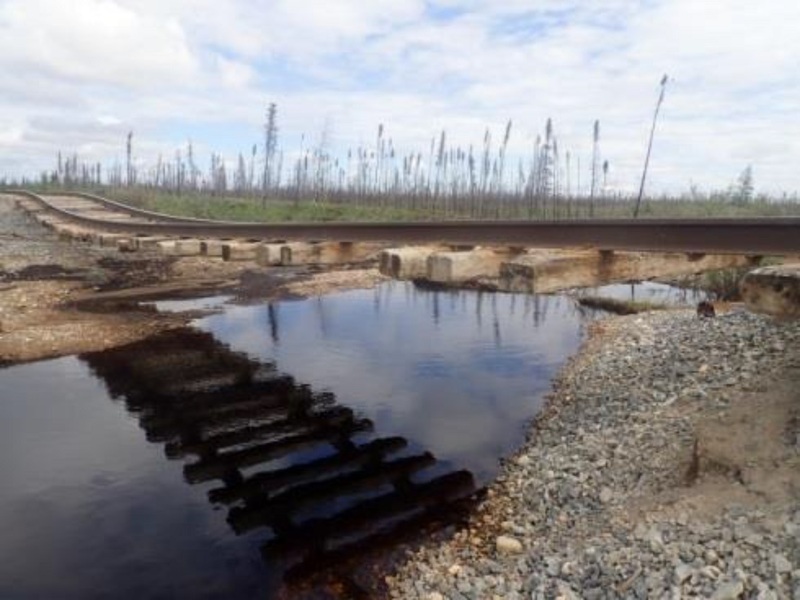 “While the Hudson Bay Railway requires significant seasonal maintenance, the extent of the damage created by flooding this year is by far the worst we have ever seen. According to subsequent news reports, OmniTrax is claiming that the flooding is a case of force majeure — or an Act of God — something the company argues releases it from its contractual obligation to repair the line. The federal government, however, isn’t buying that argument and has given the company a deadline of Nov. 12 to fix the problem or face an $18.8 million lawsuit. On November 14, OmniTrax Canada Inc. said it planned to file a claim under the North American Free Trade Agreement, arguing that the federal government sabotaged efforts to repair the rail line and transfer ownership, according to a CBC report. The same day, Transport Minister Marc Garneau announced that the federal government was moving ahead with legal action against Omnitrax by filing a statement of claim for breach of contract. CBC reported earlier, citing unnamed sources, that OmniTrax has been cutting service, raising fees and moving equipment out of Manitoba and reduced staff “to a bare minimum.” Meanwhile, Via Rail has reduced its service on the railway but was still running three times a week between Thompson and Gillam, and twice weekly between Thompson and The Pas. Via has several sign post stops between Gillam and Churchill. However, 11 of those were “serving travellers who spend a few nights in camps to go hunting and fishing,” said Via spokesperson Mylene Belanger via email. Three other stops on that section of the railway had no activity in 2016 or 2015, while four others each recorded no more than 20 stops. The two most active stops were Bird, which in 2016 had 197 passengers get on the train and another 273 get off, and Chesnaye, which in 2016 had 103 passengers get off and 99 get on. Bird served the Fox Lake Cree Nation. That station is now called Fox Lake, said Donna Lundie, transportation and medical clerk for the First Nation. The closure of the line has caused difficulties for people wanting to visit relatives in Churchill, she said. However, they can travel by road to Gillam, which is about 55 kilometres away. In his Oct. 16 statement, Mr. Tweed said that in August the company “entered into an agreement with Grand Chief Arlen Dumas of the Assembly of Manitoba Chiefs and a new coalition of First Nations buyers” but that the deal “now hinges on the federal government and its willingness to provide the requisite approvals and financial support.” He also said the transfer of the railway and the necessary repairs require government resources. “The federal government said it would help and it has not helped. In fact, it has stood in the way of both the transfer and the repair,” Mr. Tweed said. Transport Canada, however, said the Canadian government is supportive of a plan to transfer ownership of the line, provided that the assets are transferred at a reasonable price and take into account OmniTrax Inc.’s obligations; that the new owner has support from First Nations and other communities along the route; and that the new owner has a viable business plan to operate the line reliably and cost-effectively. Mr. Tweed, meanwhile, blamed recent federal government measures, including termination of Canadian Wheat Board’s single desk in 2012, the abandonment of the Churchill Gateway Development Corporation in 2013, and “the termination of grain shipping support programs” as undermining the viability of the railway. He added that OmniTrax has invested over $100 million in the enterprise “without any return” since it acquired the rail line and port in 1997. It’s the view of OmniTrax that the rail isn’t commercially viable “and should be regarded as a public utility,” he said. A National Post report published in early May, just before the line was wiped out, supports that accusation. “Employee accounts and documents obtained through freedom of information requests suggest the company has backed away from the financial promises it has made,” the Post reported. It added that OmniTrax “effectively undermined the government’s efforts to protect the port by raising fees” after the government granted $25 million in grain subsidies over five years to shippers following the dissolution of the Canadian Wheat Board’s single desk. Elden Boon, President of the Hudson Bay Route Association, also blames the current dilemma and the closure of the port largely “on Omnitrax and their lack of wanting to do business.” “It seems like they got to a point that they didn’t want to do this any more,” Mr. Boon added. Dr. Barry Prentice of the University of Manitoba said Omnitrax’s force majeure argument might have some merit but he pointed out that a railway charter also carries serious obligations. “You have to perform,” said Dr. Prentice, a professor of supply chain management at the university’s I.H. Asper School of Business, and a former director of the Transport Institute at the university. “You can’t just decide I feel a little tired and I’m not going to run any more. You have an obligation to the public as a public utility. So if you don’t perform, then one of the things the government can do is lift your charter.” Dr. Prentice did, however, note that is going to be difficult to sell a rail line that is in such a serious state of disrepair. Twenty-three kilometres to the east of the town of Churchill, on the site of a former rocket research range is the Churchill Northern Studies Institute. It is also feeling the effects of the railway closure. “For a lot of the researchers that did come and use our facility, as well as for university field courses, those people are all getting hurt by the rail line not running,” said Stephanie Puleo, the centre’s interim Executive Director. For example, a group of students from Thompson cancelled their trip because they couldn’t afford the airfare. Whereas the round-trip fare on the train was about $100, a round trip by plane would run close to $800, including taxes and fees. Moving freight has also become much more costly. When the railway was still running, the centre would spend about $4,000 a year on materials and supplies. Now it is spending about that much each month. Mr. Boon said First Nations ownership is key to reversing the railway’s fortunes. But, for the railway to succeed under new ownership, it needs a solid business plan and a vision for the future, he said. “This living on the shirt-tails of the taxpayers of this country is not an option in my opinion,” said Mr. Boon, an all-seed grain farmer based in Virden, Man., about 80 kilometres west of Brandon. Tim Heney, CEO of Thunder Bay Port Authority, said that shortly before the flood took out the line, his port shipped some transformers along it to northern Manitoba. A worker on that project told Mr. Heney that he could walk faster than the train was moving because the load was causing a “bow wave” in front of the train. He said, ‘the rail actually goes up as the train compresses the rail bed. It forms like a wave of rail in front of you.’. That fragility leads Mr. Heney to suspect that a road in the region might be easier to repair and maintain. Going back to the hay days of the Wheat Board, the port of Churchill handled around 500,000 tonnes annually, which is only a fraction of the grain Thunder Bay handles each year (7.5 – 8.5 million tonnes). “Like I used to say, ‘We could do everything Churchill did in their season in a long weekend here.’ So, really why are you spending all this effort on it?” Mr. Heney said.